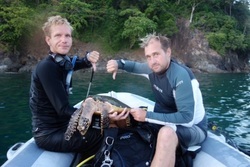 On a day where we as instructors of Blue Guru found the time to go more exploring around the local divesites we came across a sad event. On koh Pling Yai - West we found a large fishing net that reached for several meters. 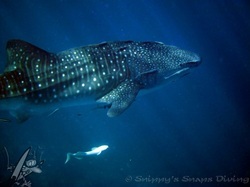 1st whaleshark sighting of the year! January 8th after a bit of a disappointing visa run my first job is guiding a snorkel trip of 9 people. As an avid diver snorkelling is not always as much fun, but I always enjoy looking at all the underwater life. And there is more chance of seeing sharks at Surin snorkelling than diving. As the Blacktip reefsharks are really shallow where divers normally do not come and they are scared of sounds so they tend to swim away before a diver can see them. This day was there for a good day as I sighted 2 blacktip sharks on the 1st snorkel session. Ever been diving in the warm coastal waters of the Indian and Pacific Oceans, like the around the Red Sea, South East Asia or Australia and come across a leopard shark, also called zebra sharks? When these sharks are spotted, they normally will be sleeping on the sandy bottoms of the reefs. You did not see one yet?? Then read here about these beautiful animals. Meet the Blacktip reefshark . Some people get scared just be hearing the word ‘Shark’, or will freak out when they see it. Most sharks however are not directly dangerous for humans. 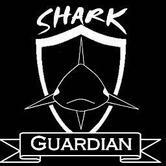 In fact sharks probably are more scared of us, than we are of them. As a Scuba Diver I love the have encounters with sharks, as I am sure many fellow divers with me. This article tells about a timid shark that can be seen in shallow waters, even during a snorkel-trip. Phi Phi is known as one of the better diving locations in Thailand, next to the Similan and Surin Islands and Koh Tao. Dive Trips to Phi Phi are run out of Phuket, Krabi, Koh Lanta and of course directly out of Phi Phi itself. So if you want to dive the Phi Phi locations, why not come and stay on the nice island itself. One of the most fascinating creatures that a SCUBA diver or snorkeler will encounter at some time during their underwater experience will be the marine sea turtle. 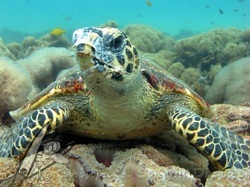 Of that family of Cheloniidae, the most beautiful is, without question, the Hawksbill Sea Turtle! With their raptor-like beak (hence the name) and its notably sharp cutting edge, their luminescent and colourful carapace (shell), the fin-like arms which differ from other marine turtles by reason of a pair of claws on each arm, and the saw-like appearance of its shell margins, the hawksbill is easily identified. The hawksbill exists throughout the world in the form of two subspecies….the Atlantic and Pacific subspecies E. i. imbricata and the E. i. bissa here in the Indo-Pacific region, which includes amongst others the andaman sea area where Snippy's Snaps Diving and myself are located (Phi Phi & Phuket). You can have multiple encounters with these beautiful creates during our dives. 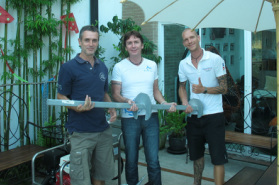 In January 2013 Aquanauts and Dive Tribe held a meeting to strengthen their partnership and bringing it to the next level and also Dive Tribe will bring the Ocean protection in the Pattaya area to the next level. The year 2013 will be a great year for the Pattaya area with big projects that are run under the name DiveTribe with the help of their proud partners and sponsors. 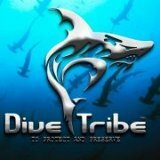 Through this post we want to introduce DiveTribe to the people that do not know them yet and give brief explanation about the exciting year that 2013 will become. Working for an international company has brought me to a lot of places around the world; the last few years mainly to Asia and then specifically to Thailand. The first time I came to Thailand in 2007 I decided to pick up my diving after 2 years, because of course Thailand is one of the best places to dive. I immediately fell in love with diving again. When my company decided to station me in Thailand for 1.5 years, I decided to continue my diving-education with Aquanauts CDC. I made it up to Dive Master that time. Not because I was pursuing a professional diving-career, but more for fun and to build up my own experience and skill level. Last year my company sent me back to Thailand again for a period of 11 months in total, and of course I was diving every weekend. These blog section gives you insights in the beautiful underwater world and its inhabitants. Some related to projects and activities of Snippy's Snaps Diving, or about interest of the diving staff.